Disclaimer: I’m sharing my experience here in hopes that it will inspire some of you. Be warned this is not me dishing medical advice—I am not a doc. Please talk to your doctor before making any medication, supplement, or dietary changes. This is the third part of my healing update… you can read part I here and part II here. What am I eating these days? I still follow the Autoimmune Protocol most of the time, but I am no longer on the elimination diet. It has been almost three years now, and I know this way of eating is most conducive to gut health with autoimmune disease. I’ve been able to reintroduce nuts, seeds, eggs, rice, and most recently some nightshades (gasp!) but still have issues with tomatoes, dairy, and beans. I am not interested in trialing grains other than rice. I’m really comfortable with where I am at, and know my limits. Even though I can tolerate quite a big range of foods now, I still eat mostly strict Autoimmune Protocol meals. I have two reasons for this—first, I know it is optimal for gut health and autoimmunity, and second, lately I have not been feeling my best (as chronicled in my last two posts). I also love the foods I eat, and I am endlessly inspired by cooking different types of meats and vegetables (being able to tolerate seed spices also helps). When I feel amazing, I tend push my boundaries a little more. At home, in a given week, I’ll eat eggs for breakfast a couple of times, or a handful of nuts in a salad. I’m not incorporating these things in my diet every day or going crazy on them. While traveling though, I find it too stressful to adhere to a “perfect AIP diet” especially since I am not reacting to certain foods. While in Austin for Paleo f(x), I enjoyed eggs every morning for breakfast, ate nightshades in BBQ, and rice at a sushi restaurant. And I felt fine the whole time! I feel like there is this idea that the Autoimmune Protocol is for life, and that those of us who have healed our bodies adhere to it strictly even after we have healed our guts. I don’t believe this is healthy—it is too disordered and restrictive to me. To some extent, I do need to live in fear of food, because I have Celiac disease. The level to which I need to avoid gluten is extreme. That being said, I don’t think it is good to extend that to foods that are otherwise healthy—like eggs, tomatoes, or almonds. Sadly, there is a fine line between a necessarily restricted gut-healing protocol and an eating disorder. Once we find health, it is important to learn how to navigate our boundaries for ourselves, since we all have unique bodies and experiences. I don’t believe the path to true healing involves living in fear of food for the rest of our lives. When I started this journey, I was hardly able to get out of bed, much less hold a job or do anything I enjoyed. Figuring out the diet piece was huge for me, and I don’t want to underestimate it. I credit finding the Autoimmune Protocol to introducing me into a world of resources and information about how to live a healthier life. And out of that, I found the right practitioners, implemented the right lifestyle changes, and it all came together to produce healing for my body, as well as my mind. I think I will always be on this healing journey, to some extent, a work in progress. I am incredibly grateful for how I feel now, and being able to help and support so many others who are going through this process for themselves. I hope these posts giving some insight into my journey have given you some inspiration or encouragement wherever you may be. Hi! I was recently told by an acupuncturist that a person with leaky gut does not need to eat raw vegetables. Cooked veggies and fruits only to allow the gut to heal. What is your opinion about this? Thank you. LaRita, cooked vegetables are easier to digest, but it is not true that raw veggies are bad for leaky gut. I like to include a little of both, but if raw veggies irritate your digestion you might consider including more cooked. I really love that you’ve been able to reintroduce so many foods. I am satisfied with where I am in my gut healing journey (strict AIP for almost a month now) but am pumped to be able to add in more foods eventually. I feel so encouraged by your posts. AIP might take a while but it’s not forever! Your post gives me some hope. 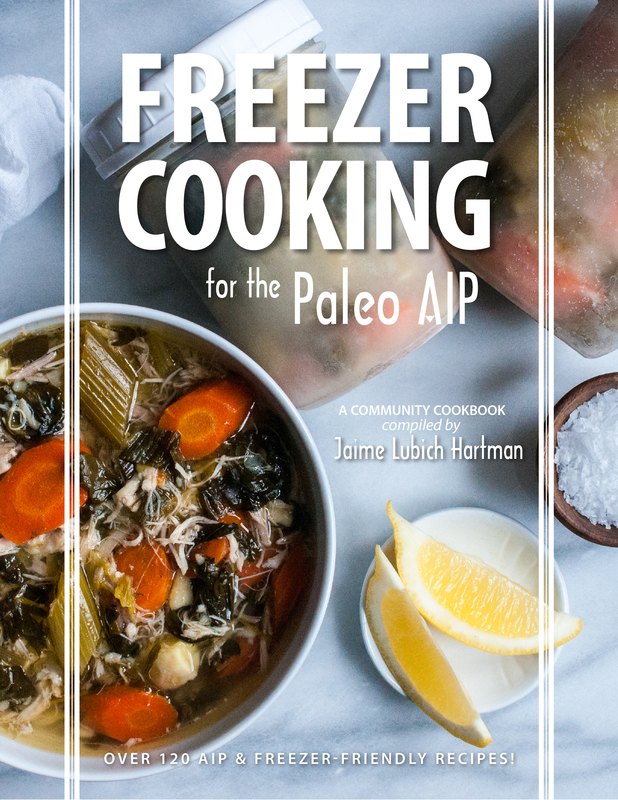 I have been paleo for three years and AIP paleo for about a year. I’ve treated SIBO and adrenal fatigue and feel better in many ways so far. However, I still seem to react to nuts/seeds/eggs/nightshades/gluten free grains. My reactions are less severe then they used to be but still uncomfortable. I suppose perhaps I have another year or two of AIP paleo until my gut heals even more! Laura, I bet you do need more time, we are all so different! Good for you for investigating root causes and getting them dealt with. I wish you continued success! This post was definitely something I needed to read. Very awesome to hear the future isn’t so dim! Just getting over the stress of moving and changing jobs. Once my new insurance kicks in in a few weeks, I’m hoping to find new practitioners to work with on my healing journey. I’m about 220 days AIP with successful reintro of nuts and I’ve had a few soy free feed pasture raised chicken egg yolks and the occasional Enjoy Life chocolate bar with no issues. When you have eggs, have you had whites as well and do you get eggs from chickens not fed soy? I’ve debated buying the eggs at Whole Foods from pasture raised chickens that only partially get feed with soy in it, but I’ve always been too scared. I eat eggs from my chickens which are not fed soy. You may be able to find truly pastured chickens not supplemented with soy feed at your farmer’s market–it is becoming more common. Good luck! I have only been able to eat the soy free eggs from farmers markets and Whole Foods. Any other eggs cause horrible stomach reactions for me. I have multiple AI diagnosises, and have been home out of work for 10 months now. I’ve recently started on the AI-Paleo diet and I really feel like it’s made a difference. I started losing some of the weight I had gained from being inactive, just from dietary changes, until they put me on prednisone for 3 months. (One month before surgery and 7 weeks after.) But I really feel like without seeing this blog and reading other people’s stories, I would not be as motivated to continue. I’ve only been doing this for about 6 months consistently now. Before I would quit after a few weeks. I think I need to be better to my body so it can be better to me. I’m hoping it will work for me as well as it works for so many others! Thanks for sharing your story, and I’m sorry to hear about the prednisone-induced weight gain. Wishing you success as you continue on your journey, and we hope you are able to stay plugged into and inspired by this awesome community. You can do it! Hi Mickey! Interesting stuff! Great to hear that you’re feeling a lot better. Hopefully your blog will show more and more people that their diet is the right way to go, not more pills :)! That is a hard one… for sauces I would use mashed root vegetables like parsnip. I don’t have a sub for tea creamer, sorry, that is a hard one! Linda, the best sub I have for you is avocado–you can try making any of my creamy dressings using avocado instead of the coconut cream. I hope it helps! Thanks! Yes I am already addicted to your orange avocado dressing recipe-it is the only really creamy thing I eat right now. Thanks so much for putting the cookbook together. I know you know what it is like to try and think of something to eat with no energy, much less fix food! It has been wonderful to just buy and fix each day and skip the planning part! Great job and what a blessing! Beautiful pictures of the birch trees. I just love birch forests! I’ve been finding that when I have bad days where I feel like I’m doing all this for nothing because i’m not seeing any results, I get afraid of food, afraid to eat because I don’t know if maybe I’m still eating something I’m sensitive to. I also get angry at my body and myself for not being as healthy as I want it to be and making choices that put me in the position I’m in now. I have to keep reminding myself that it took me 7 years to get here, and it will take more than a few weeks to fix the damage I’ve done. I’ve always been a worrier, and tend to fixate on things, so I’ve been doing more to get my mind off things, get active and outside and doing things I love (going to start taking horseback riding lessons in a couple weeks, something I’ve missed so much since I stopped doing it after high school). On the bright side, I think I finally found the missing piece of the puzzle. Yeast. I stopped drinking kombucha and after a small flair, I’m finally seeing improvement in my psoriasis. Inflammation is way down, redness is almost gone. Makes me sad though because I LOVE kombucha, and was even making it myself. Hope I can reintroduce it after my gut is healed. Thank you so much for your story and all your amazing recipes. You’ve been such an invaluable resource for me in the journey. Also sad to hear about the kombucha.. I have heard that some people do not tolerate it well. I hope you continue to figure things out and make some progress! I’ve been riding too! I find I don’t think about myself or that I’m sick for 2 hours every week! Good luck girls! This was a great read. I am wondering do you have difficulty or have you tried hard cheeses. Most people have a sensitivity to lactose so and I have heard hard cheese has barely any lactose in it. It would give me so much hope because cheese is my most anticipated reintroduction. Is there a substitute that you can suggest to use for recipies that call for eggs? Love your blog! Next week I will start my reintroducing foods again. Anxious to find out what I food allegeries I might have. I don’t have any recipes with eggs on my site or in my books. I don’t like subbing for them in recipes, I just create things that don’t use them. Good luck with your reintroductions! I have celiac, a strong dairy allergy, the MTHFR mutation, hypothyroidism, psoriasis, pernicious anemia, IC (bladder condition), genetic hemochromatosis, latex allergy (meaning certain foods like avacado affect me), and went through years of candidiasis treatment (diet, integrative medicine, naturopathy, IV treatments) before realizing these other things were why we couldn’t get that under control. After all of the treatment and all of the diagnosis I was feeling worn out. Every healing diet had things I couldn’t eat in it and your book is the first one that I could use easily. I found this blog and your cookbook on a day that I couldn’t bare more restrictions and could not think of what in the world to do about meals. I’m thankful that you decided to share an update on your healing. Diet does do a ton to help, but yes, there are times that you are perfect diet wise and genetics or parasites/non diet related illness can kick you back down. Thank you for your work, helping all of us, and please don’t feel that you have to be perfectly healthy at all times just because you write about healing diets. 🙂 Thank you for sharing the healing and the pitfalls. Congratulations on healing enough to include so many more foods as well! Hi Mickey – thanks for the updates. It’s good to see the path of someone who is progressing. How are your adrenal issues going btw? I’m on gaps with adrenal issues so was interested in your progress! I will have to check out the cookbook, i think, for some cooking ideas. This is new for me. I have diverticulitis and also hemorrhoids very swollen, to the point that I can’t sit. Im taking antibiotics, zinc oxide, and suppositories. Also diabetes and high blood pressure and taking 3 meds forvthe blood pressure. Lately I notice that my voice is changing I start talking normal and suddenly the voice change and is very sore. My hair falls a lot too. And i have a ringing in my ears for more than 10 yrs. Is anything can help me. I’m sorry to hear of your struggles–I am not a medical practitioner and I can’t offer any advice here. I would suggest going to see your doctor, or looking for someone who is trained in functional medicine or is familiar with Paleo. Sorry I can’t be of more help. Thanks for your posts! Do you avoid greens/vitamin K rich foods due to your Factor V Leiden? Did your hematologist recommend anything like this? MTHFR deficiency would indicate to increase folate rich greens and the Factor V Leiden would indicate to reduce these greens—have any of your practitioners suggested thoughts for you on this? Or have you researched yourself? Any insight would be appreciated! As far as I am aware a person with Factor V only needs to avoid greens if they are on blood thinners, as it affects their dosage of medication. I eat a moderate amount of greens, meaning I don’t avoid or excessively consume them. I try not to worry about it too much!